This entry was posted on Tuesday, August 5th, 2008 at 10:00 am	and is filed under Online marketing, Productivity. You can follow any responses to this entry through the RSS 2.0 feed. Both comments and pings are currently closed. Thanks, this helped me out. I always wondered why people called it wifi…. I always called it 802.11b when it first came out. Thanks for the comments – especially for pointing me in the right direction, @MixtLupus and @Wow. The articles that MixtLupus refers to are old. 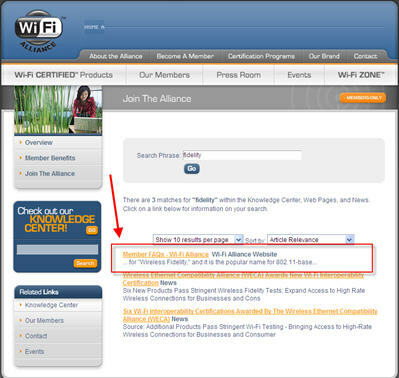 The alliance does not advertise WiFi as wireless fidelity anymore. You can check the glossary of that website if you have doubts. It is not broken out like WiMAX, which actually does mean something. The alliance abandoned wireless fidelity very early on. You should have stood by your research or at least look into Mix’s claims before claiming that he/she is a reliable source. Just like you shouldn’t trust what I say until you look it up yourself. Tnx 4 the 411 what wi-fi stand 4. I thought it was Word-Interference – Free-Internet. Lol..